To make pastry, sift the flour, add the caster sugar and rub in the butter with your fingertips until the mixture resembles fine breadcrumbs. Add enough beaten egg to bind the pastry. The pastry can also be made using a food processor. Cut a circle of parchment to fit a large pastry dish, sprinkle with flour, roll out the pastry on the floured parchment and then slide it into the dish and bake blind for about 15 minutes. Meanwhile boil the ingredients for compote for 3 – 4 minutes. When pastry is baked, fill with the apple and cranberry compote. To make the crumble topping, combine the flour, sugar, butter and oats in a food processor until it resembles coarse breadcrumbs. (Add the oats last if you would like them to stay coarse and be visible in the crumble). 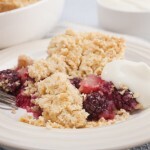 Sprinkle the crumble over the fruit and bake in the oven for about 40 minutes. Next PostNext Everyone can cook..